Biotechnology is an interdisciplinary field which helps society to deal with challenges that come from global climate change, food crisis and food security, pests and diseases control, prevention and cure of diseases and much more. Graduate degree in Biotechnology is providing ample opportunities for those who want to explore the new and modern frontiers of science. The applications of Biotechnology are enormous as it caters to various industrial sectors like food, textiles, pharmaceutical, agriculture, animal husbandry and many more. Having a strong foothold globally, biotechnology as a career option is immense as we live in exciting era where there are amazing discoveries, new applications and innovative products on the market every day. After completing their graduation, Biotechnology graduates can qualify various national level entrance examinations conducted by Universities and institutes like JNU/NITs/IITs/TIFR etc. to pursue a postgraduate degree in Biotechnology from any institute of national and international repute in India as well as abroad. Biotechnologists play a vital role in the continuous search to find new, sustainable solutions to the global challenges. They can work in various work environments like industrial sector, environmental sector, medical sector, food manufacturing, health-care and pharmaceuticals and academics. Professionals in this field can develop their expertise in one or more subfields like genomics, proteomics, and bioinformatics. 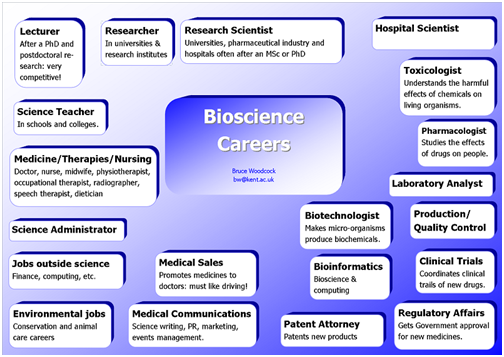 Entry-level biotechnologist or candidates with a bachelor’s degree in biotechnology can work as Research/Lab technicians. They help out teachers and scientific professionals to conduct and monitor experiments and may also record data and prepare reports. Postgraduates in Biotechnology can qualify the examinations like NET(National Eligibility Tests)/SET(State Eligibility Tests)/GATE(Graduate Aptitude Test in Engineering) conducted by various agencies like CSIR, UGC, ICMR, ICAR, IIT etc to pursue a successful research and teaching career at any University, College, School or institute. As far as industries are concerned, major recruiters for Biotechnology graduates include industries engaged in processing and developing agricultural and biological products, bio-processing industries, pharmaceutical, biopharmaceuticals and chemical industries. There are ample opportunities in industries producing healthcare products, textile industry, cosmetics and organizations engaged in different types of industrial research and development. The Department of Biotechnology offers graduate, postgraduate and Ph. D programmes which imparts fundamental as well as real world problem solving approach to its students for the development and betterment of the society. Over last decade the Department of Biotechnology has engaged students in various beneficial and innovative activities such as Lab to Land, Periodical Newsletters, Creative Assignments, STAR Projects, and Internship Programmes at campus, Earn While You Learn scheme, Research Proposal Writing and SOP preparation for various laboratory instruments. The department facilitates students with an enormous infrastructure to enable nearly five hundred students each year to learn and explore various aspects of biotechnology with the aid of several sophisticated instruments and techniques. We are pioneer in exposing students to Plant Tissue Culture, Bioinformatics and Animal Tissue Culture techniques in the Saurashtra region of Gujarat. We motivate the students to aim for sustainable development by encouraging recycling of waste into useful products such as Recycled Paper and Flowers' preparation from agriculture waste. Department of Biotechnology is proactively engaged in student placement and pre-placement training. Department has organized several pre-placement training programmes in association with training and placement cell of the institute. The institute has signed a MOU with MNCs like Zydus Cadila Healthcare Ltd., Ahmedabad for student training and placements. Many alumni of the department have served in these MNCs at high level positions for years which, have built reputation of this institute as epicentre of skilled human resource. Major recruiters at Department of Biotechnology include Zydus Cadila Healthcare Ltd., Ahmedabad, Intas Pharmaceuticals Ltd., Ahmedabad, Sun Pharmaceuticals Ltd., Baroda, Reliance Life sciences, Mumbai, TATA Consultancy (TCS) Ltd., Gandhinagar, Sarjan Biotech. Pvt. Ltd., Bhuj, Span Diagnostics, Surat, Excel Cropcare Ltd., Mumbai, Claris Pharmaceuicals Ltd., Ahmedabad, Amneal Pharmaceuticals Ltd., Ahmedabad, Enzene Bioscience, Pune, Adani Masala Pvt. Ltd, Rajkot, Oceanic food ltd., Jamnagar, GVK- EMRI, Ahmedabad and many more. Our students have also joined several academic organizations for teaching and research career. Department has catered the need of skilled human resource for industries and organizations from the sectors like Biopharmaceutical, Healthcare, Agriculture, Food, Environmental Management, Information Technology with more than 50% candidates opting for a career in industry and academics. © Copyright 2018 vsc.edu.in. All Rights Reserved.